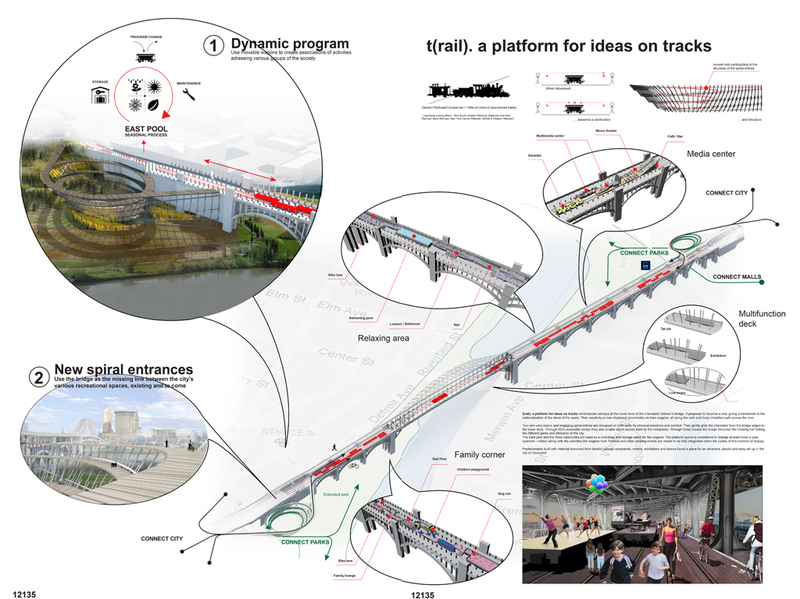 The project reintroduces railways at the lower level of the Cleveland Veteran’s Bridge. It proposes to become a tool, giving a framework to the materialization of the ideas of the users. Their creativity is now displayed dynamically on train wagons, all along the safe and lively inhabited path across the river. Two new very scenic and engaging spiral entries are designed on both ends for physical presence and comfort. They gently grab the interested from the bridge edges to the lower deck. 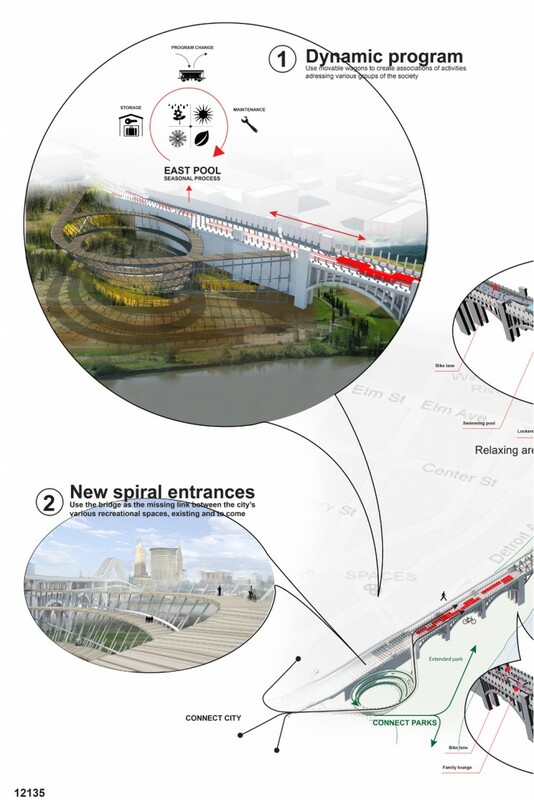 Through ADA accessible ramps they also enable direct access from/ to the riverbanks. 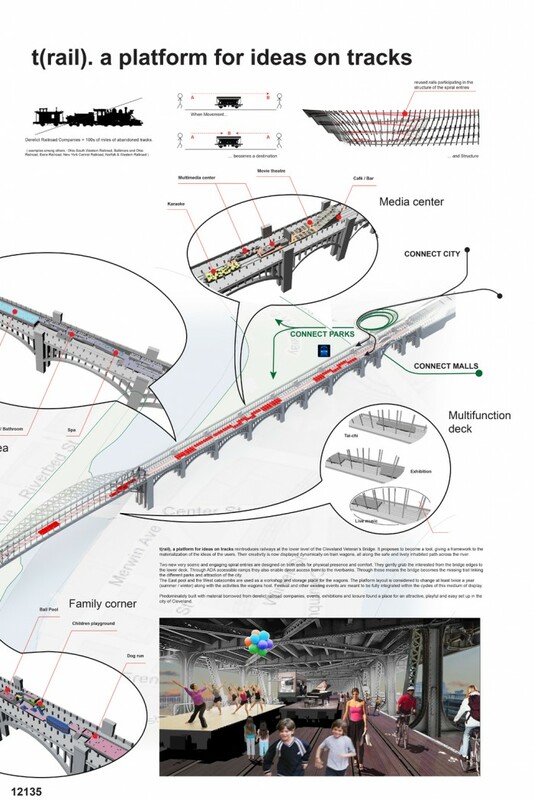 Through these means the bridge becomes the missing trail linking the different parks and attraction of the city. The East pool and the West catacombs are used as a workshop and storage place for the wagons. The platform layout is considered to change at least twice a year (summer / winter) along with the activities the wagons host. Festival and other existing events are meant to be fully integrated within the cycles of this medium of display. Predominately built with material borrowed from derelict railroad companies, events, exhibitions and leisure found a place for an attractive, playful and easy set up in the city of Cleveland.